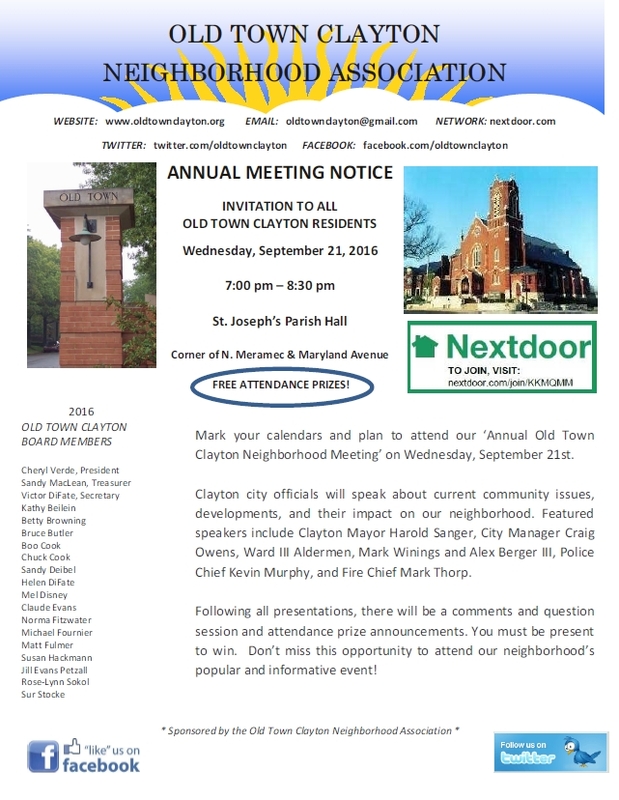 Mark your calendars today and plan to attend our ‘Annual Old Town Clayton Neighborhood Meeting’ on Thursday, September 27th from 7 pm - 8:30 pm, at St. Joseph Parish Hall in Clayton. 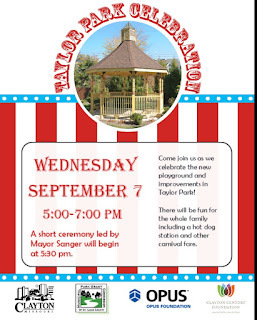 Clayton city officials will speak about current community issues, developments, and their impact on our neighborhood. Featured speakers include Clayton Mayor Harold Sanger, City Manager Craig Owens, Ward III Aldermen, Mark Winings and Bridget McAndrew, along with Police and Fire representatives. Following all presentations, there will be a question and answer session. Do you have any particular talking points you want addressed at our meeting? Do you have any gift certificates you wish to donate for this event? As in the past, attendance prizes are awarded to some lucky attendees at the end of our meeting, and you must be present to win. Don't forget to connect with your Old Town Clayton neighbors on Nextdoor.com. It's easy and free to sign up at https://oldtownclayton.nextdoor.com To date, we have a total of 398 Old Town Clayton members which is an increase of 57 new members this past year. Nextdoor has increasingly become a valuable resource for our neighborhood. Help spread the word to all your neighbor friends. Don’t miss this opportunity to attend our popular and informative neighborhood event! Let's have a record turnout on September 27th! A reminder will be posted prior to the meeting. Call for action TODAY! Blood donations needed! Because of the short notice, you can simply walk into the Center to donate. If you can't make it, could you share this info on your social media to spread the word about the need for donors? The Board will be addressing whether to allow the community access to the green space at the Maryland School property as a condition for use. The Architectural Review Board listed this as a condition for use but it was removed by the Board after a controversial vote. It will be up for a new vote at the meeting after an appeal by concerned residents. A good turnout is needed to show the need for proper compliance with current zoning ordinances. Please attend! Mark your calendars and plan to attend our ‘Annual Old Town Clayton Neighborhood Meeting’ on Thursday, September 28th from 7 pm - 8:30 pm, at St. Joseph Parish Hall. 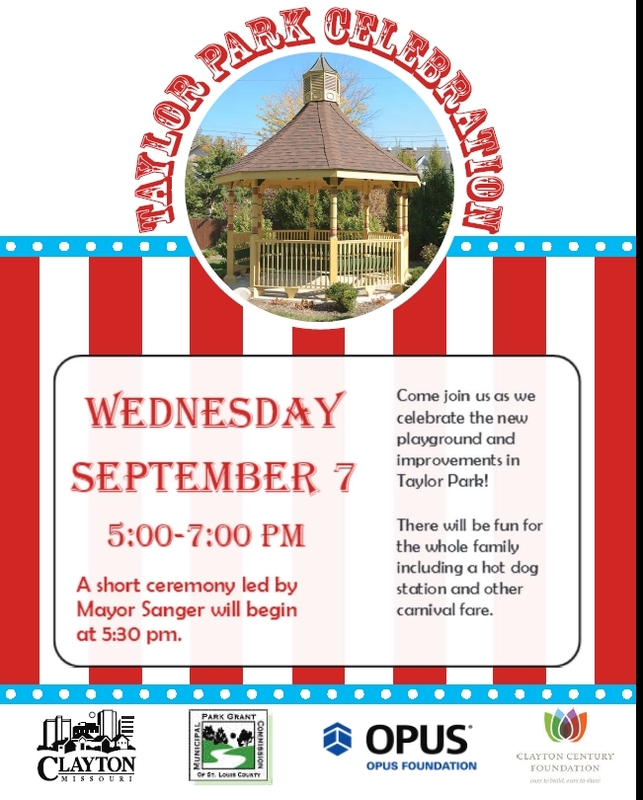 Clayton city officials will speak about current community issues, developments, and their impact on our neighborhood. Featured speakers include Clayton Mayor Harold Sanger, City Manager Craig Owens, Ward III Aldermen, Mark Winings and Alex Berger III, and Police and Fire representatives. Following all presentations, there will be time allowed for a question and answer session. Lastly, attendance prizes will be awarded where you must be present to win. Don’t miss this opportunity to attend our popular and informative event! If you haven’t already joined our free neighborhood network on NextDoor.com, you can sign up at https://oldtownclayton.nextdoor.com To date, we have 341 Old Town residents signed up as members. I am pleased to report that we gained 124 new members this past year. Nextdoor has become a valuable resource for our neighborhood. Do you have any particular talking points you would like addressed at our meeting? Hope to see many of you on September 28th! * A strong turnout Of Old Town Clayton neighbors is encouraged for voices to be heard on Maryland School's future. July 28, 2017: The School District of Clayton has entered into a contract to sell the Maryland School property to Centene Corporation (NYSC: CNC). The agreement was finalized earlier this week. Centene is planning to use the building to house its Centene University, which will offer its flagship leadership development program to Centene employees. It will also house its early childhood development center for employees’ children. While significant rehabilitation of the building is needed, Centene is committed to minimizing disruption to the extent possible to the immediate community. The District recently put the Maryland School back on the market and received seven offers to buy and one offer to lease the property. The Board of Education voted unanimously to move forward with Centene’s proposal. The District last used Maryland School as an elementary school in 1980. Since being closed as an elementary school, the school has been rented to a private pre-school/elementary school and used as a temporary site for both District’s early childhood program and The Wilson School. Terms of the contract (including sale price) cannot be disclosed until both parties have closed on the sale and the transaction is final. Centene Corporation, a Fortune 100 company, is a diversified, multi-national healthcare enterprise that provides a portfolio of services to government sponsored healthcare programs, focusing on under-insured and uninsured individuals. Many receive benefits provided under Medicaid, including the State Children's Health Insurance Program (CHIP), as well as Aged, Blind or Disabled (ABD), Foster Care and Long Term Care (LTC), in addition to other state-sponsored programs, Medicare (including the Medicare prescription drug benefit commonly known as "Part D"), as well as programs with the U.S. Department of Defense and U.S. Department of Veterans Affairs. Centene operates local health plans and offers a range of health insurance solutions. It also contracts with other healthcare and commercial organizations to provide specialty services including behavioral health management, care management software, correctional healthcare services, dental benefits management, in-home health services, life and health management, managed vision, pharmacy benefits management, specialty pharmacy and telehealth services. Dave Cooperstein would like to update our neighborhood regarding the property renovation at 7701 Maryland. New architects from Clayton's Patterhn-Ives, llc have been hired to help meet the project's budget. They have come up with a fantastic, potentially beautiful new scheme, that handles the site in a slightly different way. It is believed that there are a number of elements of the site design that will be even MORE appealing to the adjacent neighbors. There will be coffee and dessert available, and a question/answer session will follow the presentation. Mark your calendars and bring your neighbors on August 3rd. The Clayton Board of Education will be meeting to discuss (not vote) on the Maryland School property. Everyone is encouraged to attend and help spread the word. A large turnout could impact their discussion. Chris Tennill, Chief Communications Officer from the Clayton School District, would like to invite residents to provide high-level feedback from our Old Town community about options for next steps with the Maryland School property. They would like to hear from members of the Old Town Clayton Neighborhood Association, particularly those who live close to Maryland School, about their thoughts for the future use of the property. This, along with the survey that was sent out last week, will be one of several data points the Board of Education will use to make a decision about next steps for the property. Another link to the survey is below for those of you who want to take it. The District last used Maryland School as an elementary school in 1980. 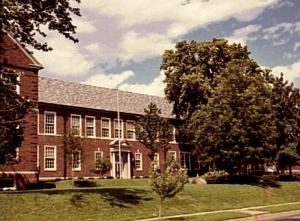 Since being closed as an elementary school, the school and its grounds have been used as: rental property to a private preschool/elementary school (Clayton Academy), a temporary site for the District’s early childhood education program during construction and a temporary home for The Wilson School after a fire. A sale of the property fell through last year when the buyer could not obtain the necessary rezoning. Review helpful background information before you take the survey. Renovate the building for potential future use by the District or an outside entity. Make only needed repairs to the building and retain the entire property for potential future use. Sell the six out-lots (for single-family homes). Retain the remaining two acres for potential future use. This would include razing the building, creating green space with the remaining two acres, which could be used for potential future use or eventually sold for single family homes. The City of Clayton would like to invite you to join the Parks & Recreation Commission at their next meeting on Monday, May 1st at 6:00 pm in Hanley Park. The Commission will discuss potential plans for the newly acquired property on the west side of the park as well as gather any suggestions you might have to improve the park. 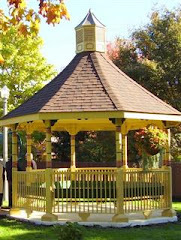 They will meet by the Pavilion (weather permitting) or inside if necessary. 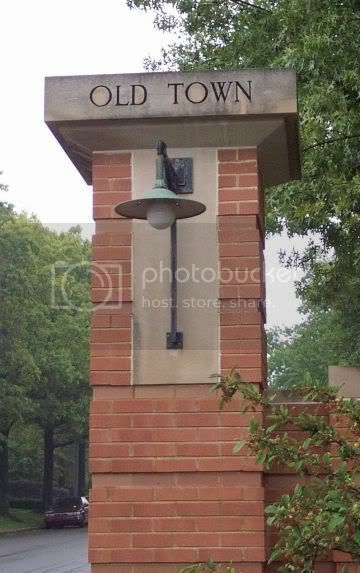 In particular, they would like to discuss the location for a gate on the west end of the property as well as a path to connect that entrance to the other paths in the park. If you are unable to attend the meeting but would like to provide input please feel free to contact Patty DeForrest, Director of Parks & Recreation at pdeforrest@claytonmo.gov or 314-290-8464. The Board of Education will be discussing future options for the Maryland School property at their meeting at 7 p.m. on Wednesday, March 29. These options range from keeping the property as is to selling it all for single family housing to selling a portion of the property and razing the building, with a few others in between. 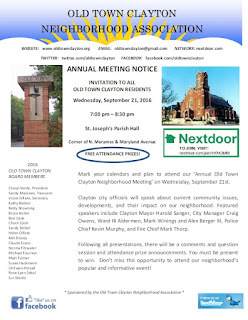 Mark your calendars and plan to attend our ‘Annual Old Town Clayton Neighborhood Meeting’ on Wednesday, September 21st, 7 pm - 8:30 pm, at St. Joseph Parish Hall. Clayton city officials will speak about current community issues, developments, and their impact on our neighborhood. Featured speakers include Clayton Mayor Harold Sanger, City Manager Craig Owens, Ward III Aldermen, Mark Winings and Alex Berger III, Police Chief Kevin Murphy, and Fire Chief Mark Thorp. Following all presentations, there will be a comments and question session and attendance prize announcements. You must be present to win. Don’t miss this opportunity to attend our neighborhood’s popular and informative event! If you haven’t already joined our free neighborhood network on NextDoor,com, I encourage you to do so. I invite you to check it out at https://nextdoor.com/invite/nvfqymwxyjhxqeckpcrd To date, we have 217 Old Town residents signed up as members. Ask your neighbors how they like it. Let me know in advance if you have any particular talking points you want addressed at our meeting by our city officials. Thanks! Are you interested in local history? The Clayton Century Foundation is seeking volunteers to help interpret our local history. Open to the public on June 1st, the Clayton Heritage Center for Historical Research located in the lobby of the Center of Clayton will be a wonderful asset to our community. Volunteers are essential in order to sharing this important resource with our friends and neighbors. And it's our goal to make volunteering as enjoyable for you as it is valuable for us. If you have enthusiasm, good customer service skills, enjoy history and exploring cultural organizational environments and are a lifelong learner, then volunteering at the Heritage Center may be for you. We seek volunteers from diverse backgrounds to help tell the story of all Claytonians. From greeting visitors to working behind the scenes, every volunteer brings meaning to the work that they do. Please email CCF History or leave message at (314) 467-0712 to register as a volunteer and attend this special training event. Love Investment Company (Love) has terminated its contract to purchase the Maryland School property from the School District of Clayton. The proposed Maryland School Town Homes development, which had its re-zoning petition denied by Clayton's Plan Commission a few weeks ago, would have generated about $400,000 of new annual tax revenue. Love's plans for the project included building 25 attached, luxury, single-family townhomes on the property. "We appreciate the effort Love put forth in attempting to make this project happen as it represented the highest and best use for that property, and we respect and understand their decision," said Chief Financial Officer Mary Jo Gruber. "In terms of next steps for the property, the Board of Education will continue to evaluate options for the Maryland School property and will keep the community updated as they move through that process." Coffee and light dessert will be served. RSVP’s appreciated, (leave voicemail .at 314-246-0712), but walk-ins are more than welcome. Kol Rinah, a Conservative Jewish congregation of St. Louis, would like to invite the Old Town Clayton Neighborhood Association to an Informational Meeting and Q&A regarding their proposed development of the property at 7701 Maryland Ave, Clayton, MO (currently occupied by the Journey church). Who is Kol Rinah, and why are we moving? What are the plans for renovation and addition of the property? How are we handling the parking situation? What is our general timeline? The meeting will take place on Wednesday, March 2, 2016 at 6:30 pm. The location of the meeting is currently To Be Determined (within the next 24 to 48 hours). As soon as a meeting location is determined, we will let the Neighborhood Association know accordingly. Join Kol Rinah for coffee and light dessert, listen to a brief presentation of the current plans for the property, and answer any questions you might have about our exciting move into your beautiful neighborhood. RSVP’s appreciated, (leave voicemail at 314-246-0712), but walk-ins are more than welcome. 'The resident voice won again on Tuesday as the Clayton Plan Commission voted to not recommend approval of a project of 25 town homes that’s proposed for a neighborhood of single-family homes. A developer wants to build a cluster of town homes with underground parking at 7501 Maryland Avenue, replacing a school that has been unused since 1983. The developer is not asking for any tax incentives. Tuesday, February 16, 2016 - 5:30 p.m.
City of Clayton – 2nd Floor Council Chambers - 10 N. Bemiston Ave. Consideration of the following applications submitted by Bruce Korn, Maryland School Town Homes, LLC, owner/developer, to allow the construction of six buildings containing 25 fee simple townhomes, 50 underground parking spaces and a private street. 1. RezoningPC: A public hearing to solicit input to rezone the subject property from R-2 Single Family Dwelling District to R-4 Low-Density Multiple Family Dwelling District. 2. Rezoning PC: A public hearing to solicit input to rezone the subject property from R-4 Low Density Multiple Family Dwelling District to a Planned Unit Development District (PUD). 3. Planned Unit DevelopmentPC: A public hearing to solicit input regarding the proposed Planned Unit Development (PUD). 4. Subdivision PlatPC: Consideration of a major subdivision plat that creates 25 fee simple lots, 48,890 square feet of common area (including a new private street) and provides an 83-square-foot right-of-way dedication at the southeast quadrant of the property. The proposed plat also includes the creation of utility easements on existing lots addressed 7500-7520 Westmoreland Avenue. 5. Architectural ReviewARB: Consideration of the design and materials associated with the proposed townhome development. Please plan to attend the City Plan Commission meeting on Tuesday, February 16 at 5:30 pm at City Hall, 10 N. Bemiston, 2nd Floor. The latest proposal for the Maryland School property will be presented by the developers. They are requesting an unprecedented upgrade in zoning that if approved could affect all residential neighborhoods in Clayton. We hope you will show up to voice your concern and show your support for following the zoning ordinances and Land Use plans that have long been in place. The developer’s plan has changed very little since they received a unanimous negative recommendation on this project last May. This is a very important time for Clayton with many planned developments coming to the City. We need to reiterate that only those in accordance with local and state laws should be approved. This cannot be a case-by-case assessment process.